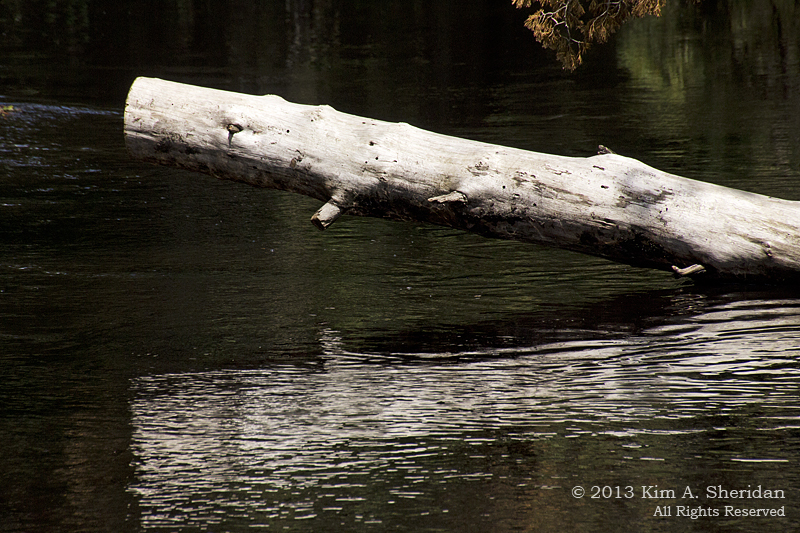 I went to Michigan hoping to come home with lots of amazing wildlife shots. 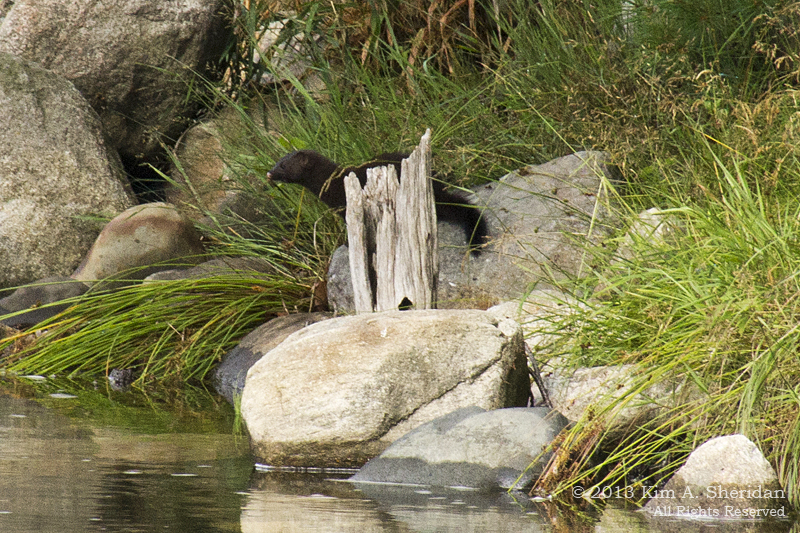 Last year I saw minks, for gosh sakes. And this year I have this great new long telephoto zoom lens. 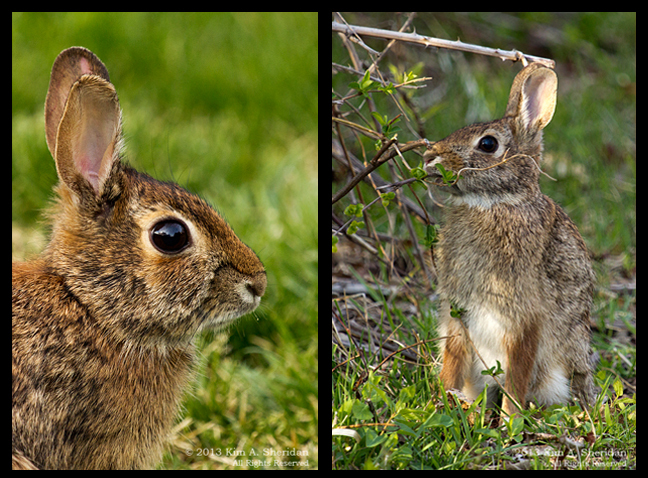 Confoundingly, Michigan critters are quite camera shy. 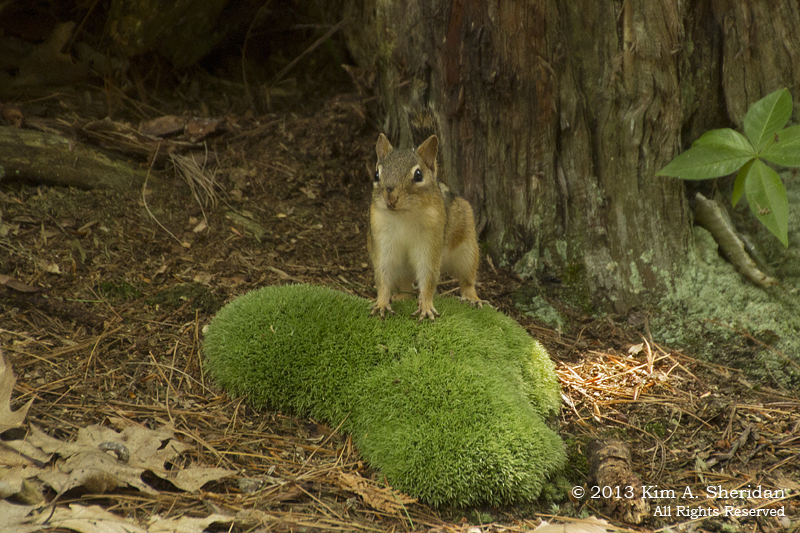 No mink, no deer, only one chipmunk. Birds – oh, yes, there were birds. I could hear them all around me, nattering away constantly. But they insisted on playing hide-and-seek with me, teasing with brief flashes of black and yellow, but never settling down long enough to visit. Here are some of the animals I did manage to capture, mostly of the winged variety. 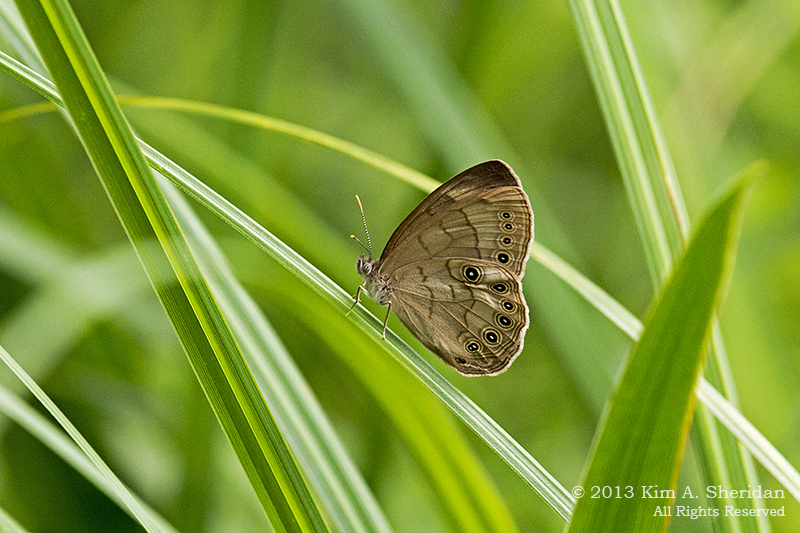 Above is a Northern Pearly-eye Butterfly in Ludington State Park. Check out the natty striped antennas. 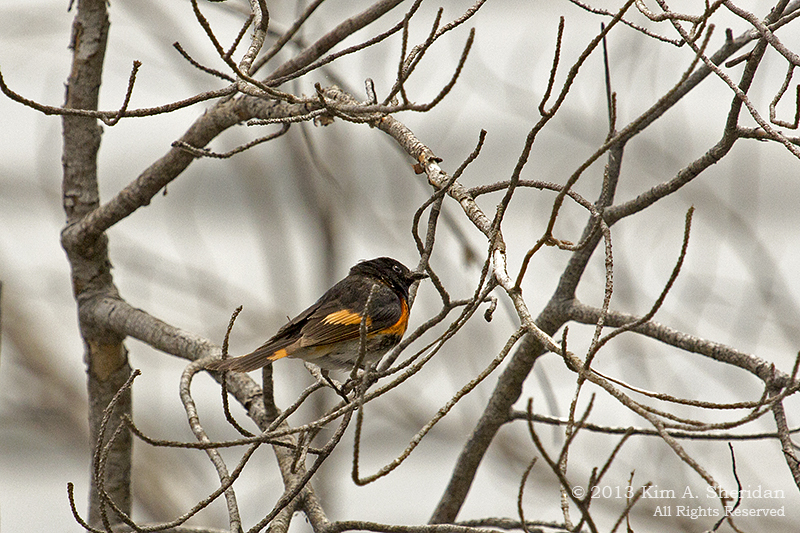 American Redstart, Ludington State Park. 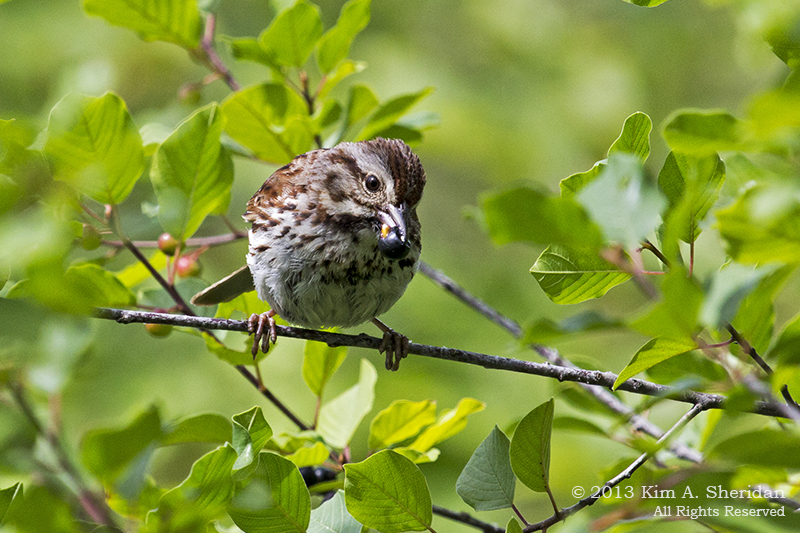 Song Sparrow, Mitchell State Park. 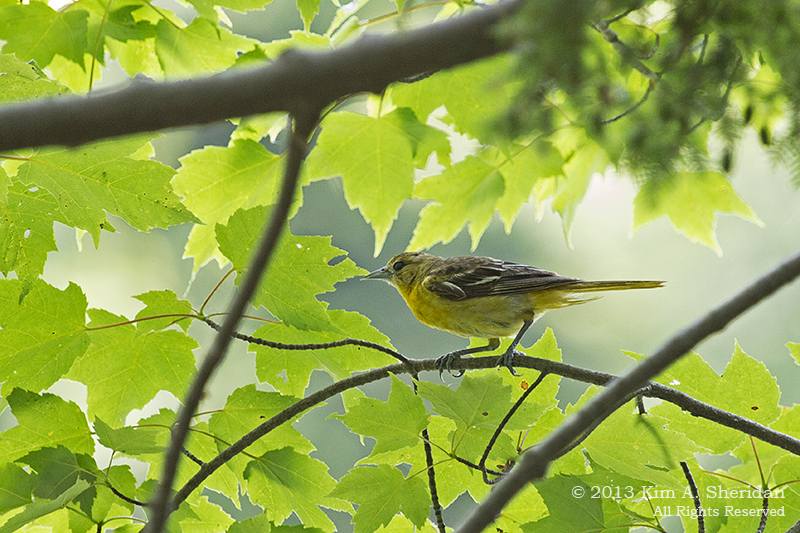 Unidentified Warbler, Nordhouse Dunes Wilderness Area. Maybe a female or juvenile Blackburnian? A little help, anyone? 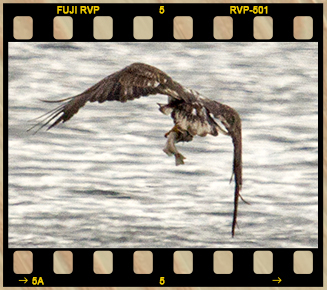 A juvenile Bald Eagle searches for prey, spots his quarry, closes in, and – IMPACT! Looks like fish for lunch today. 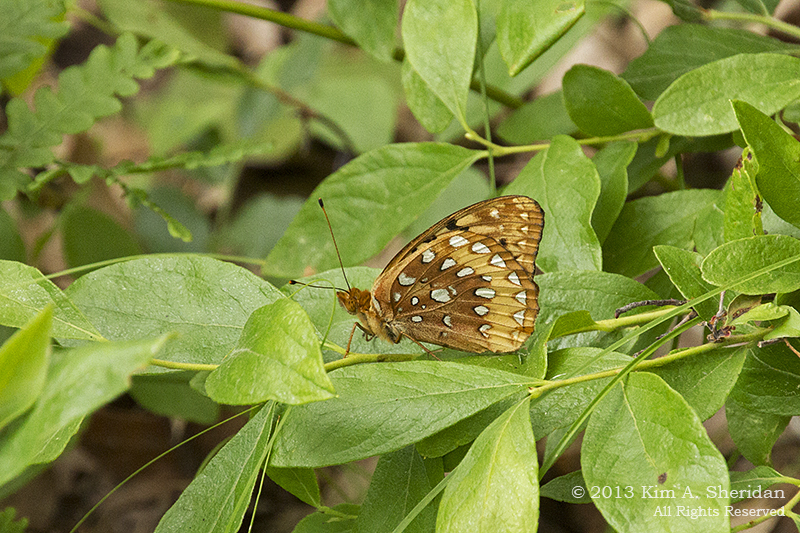 Great Spangled Fritillary, Nordhouse Dunes Wilderness Area. Who comes up with these names, anyhow? 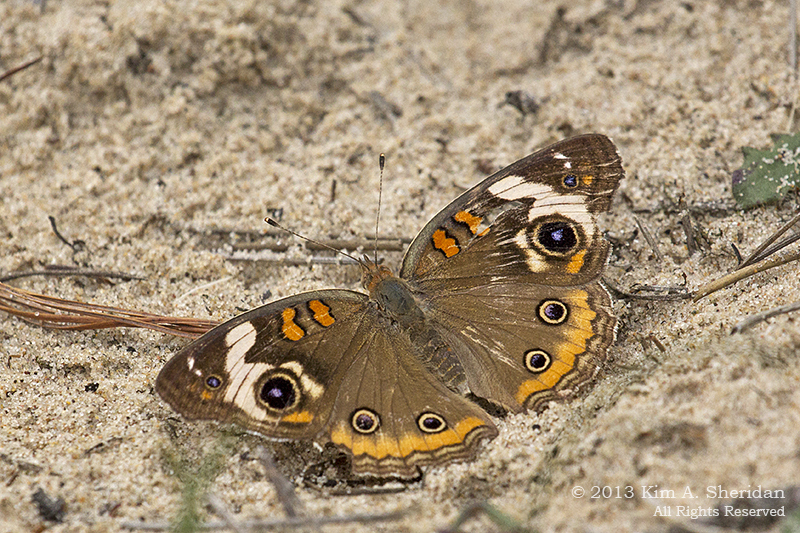 Common Buckeye, Ludington State Park. 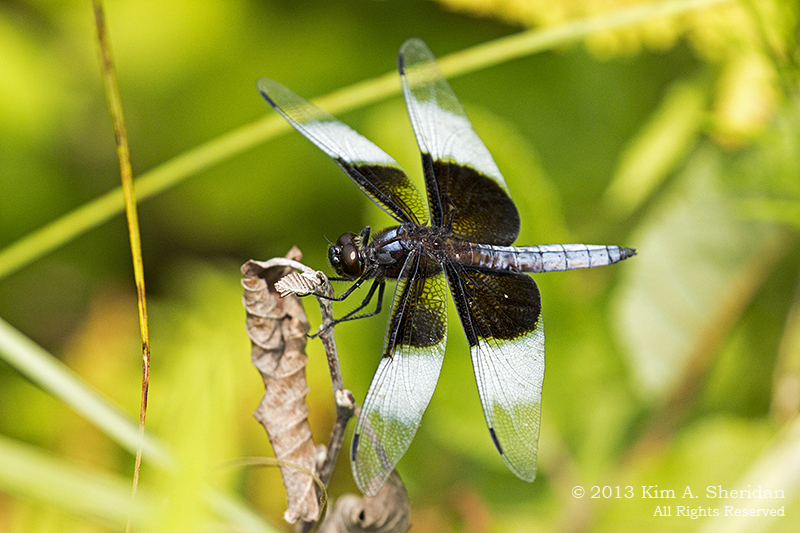 Widow Skimmer, Ludington State Park. 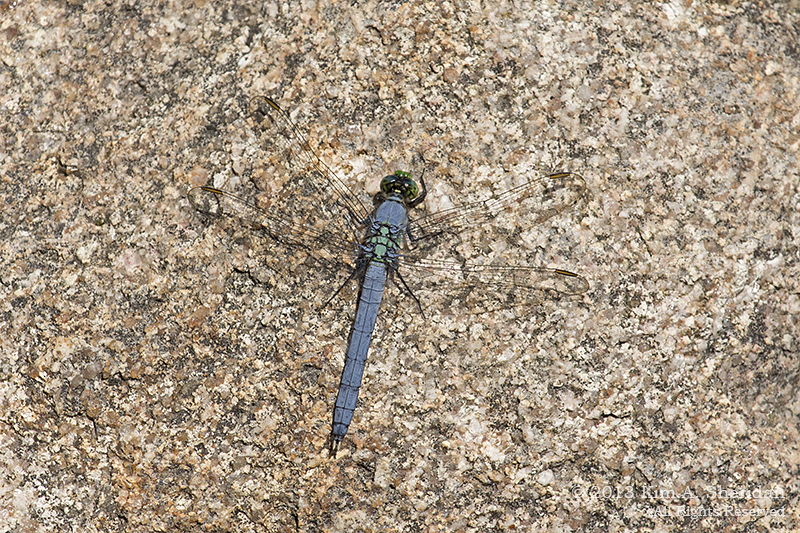 Eastern Pondhawk, Ludington State Park. Sometimes dragonflies, butterflies and birds of the same species come in different colors. Usually it’s a male/ female thing. 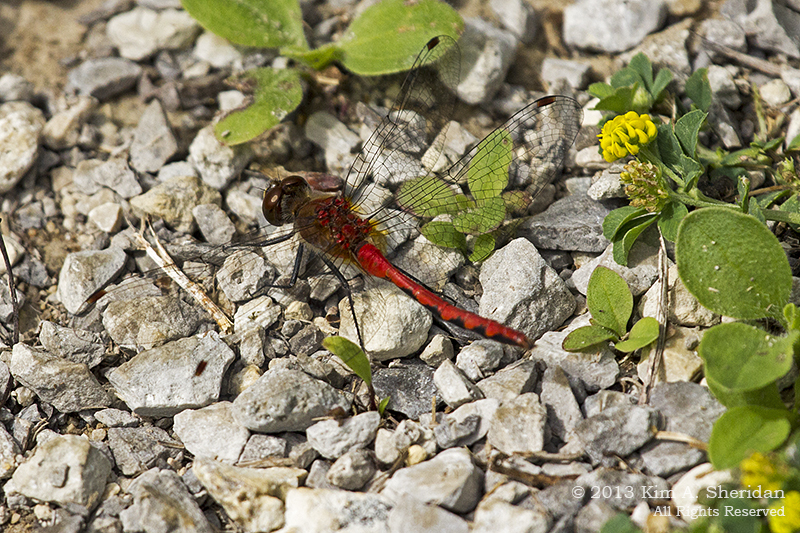 For instance, here’s a Ruby Meadowhawk female. Not particularly Ruby, is it? 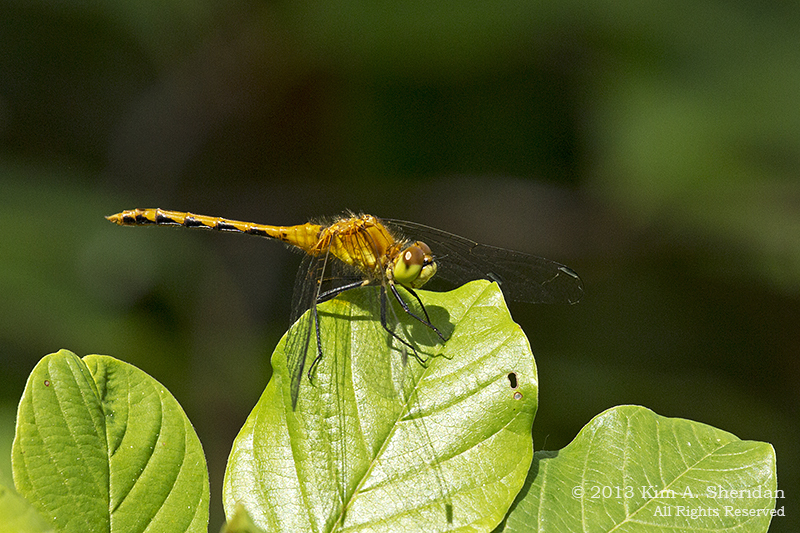 But here’s the male Ruby Meadowhawk, and now it’s obvious where the name came from. Mitchell State Park. 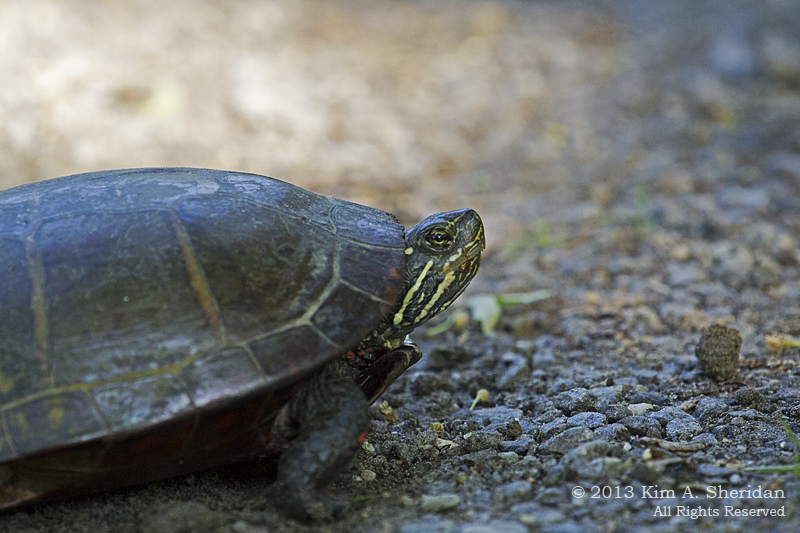 And now, for some scaly things: Midland Painted Turtle, Mitchell State Park. The front fellow’s a little shy, typical of most of the critters I saw – or didn’t see – in Michigan. 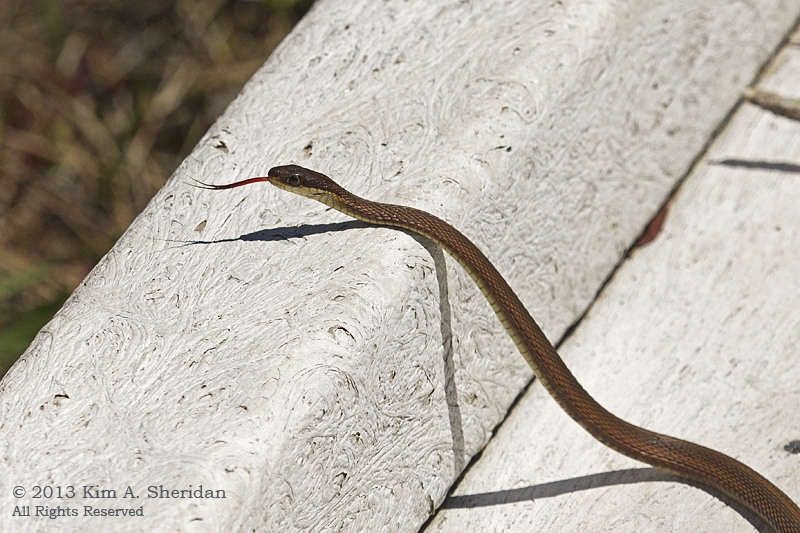 Near misses: Occasionally along the Mitchell Heritage Nature Trail I would hear “shish-shishhh-shish” as a small snake slithered off into the grass. I rarely actually saw them. 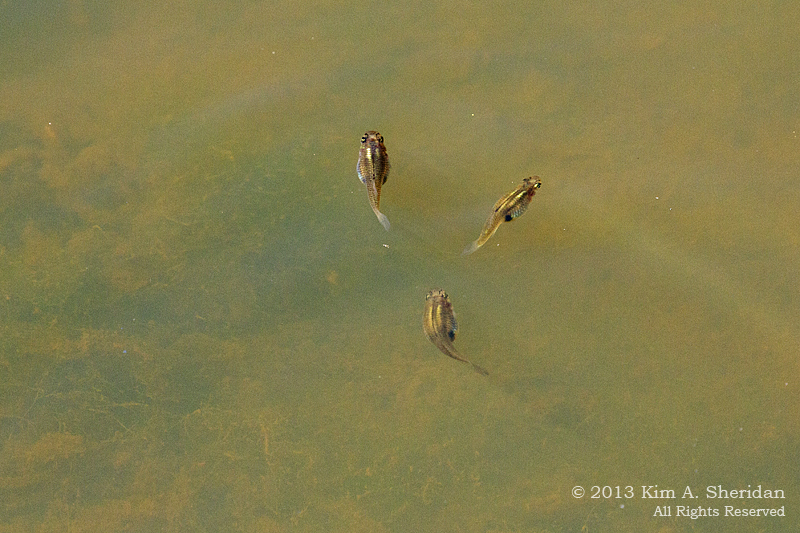 I also heard the distinctive banjo-like “twang” of a Green Frog a few times. 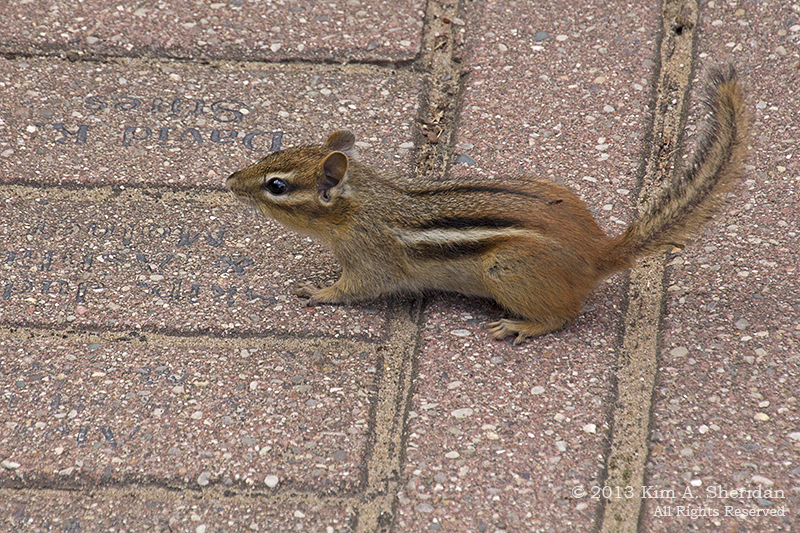 Ending on a furry note: Chipmunk, White Pine Village. This year ranked as one of my more unusual Independence Day holidays. 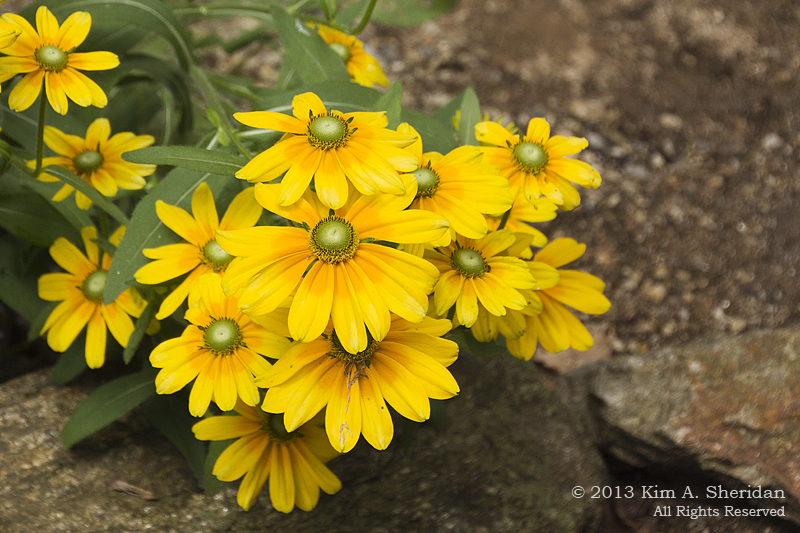 Several Refuge friends and I went exploring in Fairmount Park and then the Morris Arboretum. Fairmount Park in Philadelphia is the one of the largest urban park systems in the US, and spreads throughout much of the city. 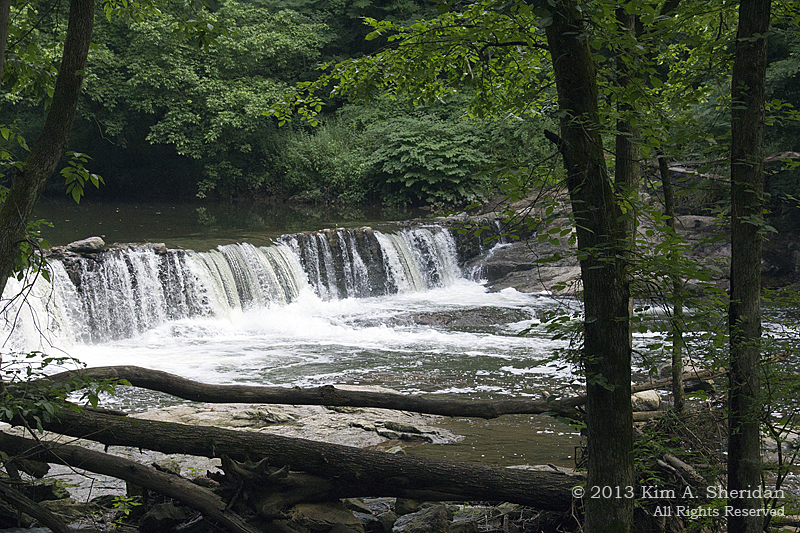 The 1800 acre portion along the Wissahickon Creek, known as the Wissahickon Valley, is actually a gorge, with the wooded slopes rising nearly 200 feet above the Creek. It’s as close to wilderness as one could be in a big city. 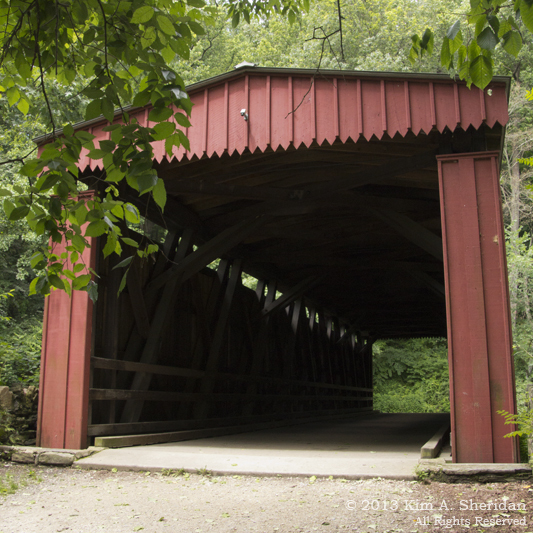 Our primary goal here was to see the Thomas Mill Road Covered Bridge. To reach it we took a long, easy walk down Forbidden Drive. 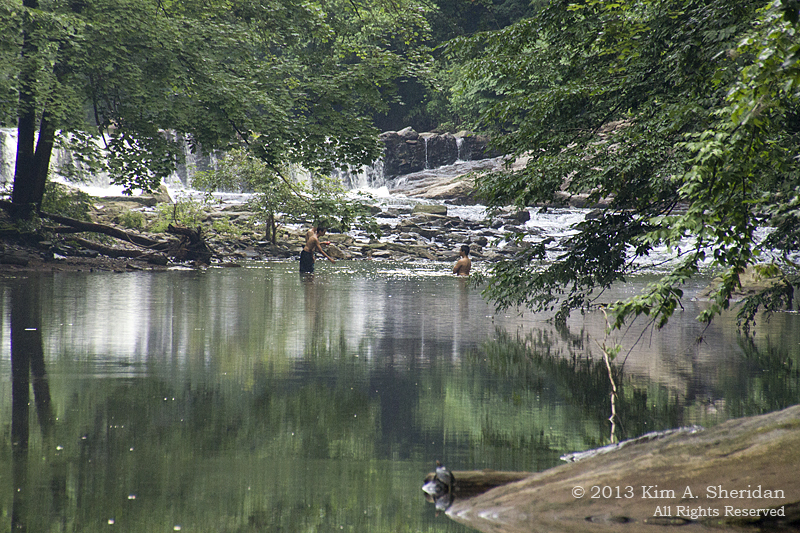 Kids swimming in the Creek. It was hot and humid, and later in the day I really wanted to join them. One of the remnant dams along the Creek. The dams supplied water to run the waterwheels of the lumber, paper, and grist mills that once populated the Valley. I spent some time trying to persuade at least one Eastern Tiger Swallowtail butterfly to be still long enough for a picture. Didn’t have much luck. 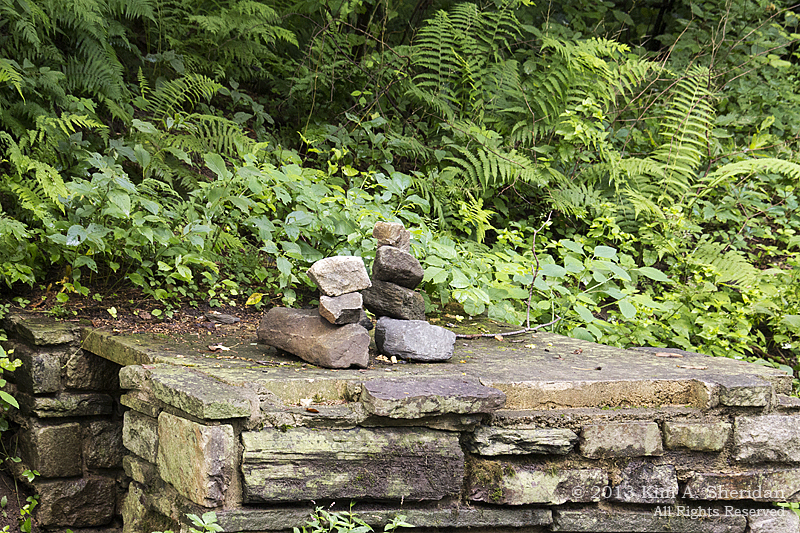 More trail art. Courtesy of Mother Nature this time. Really cool old building, originally part of a nearby mill, but rebuilt by the Works Projects Administration (WPA) in 1938. 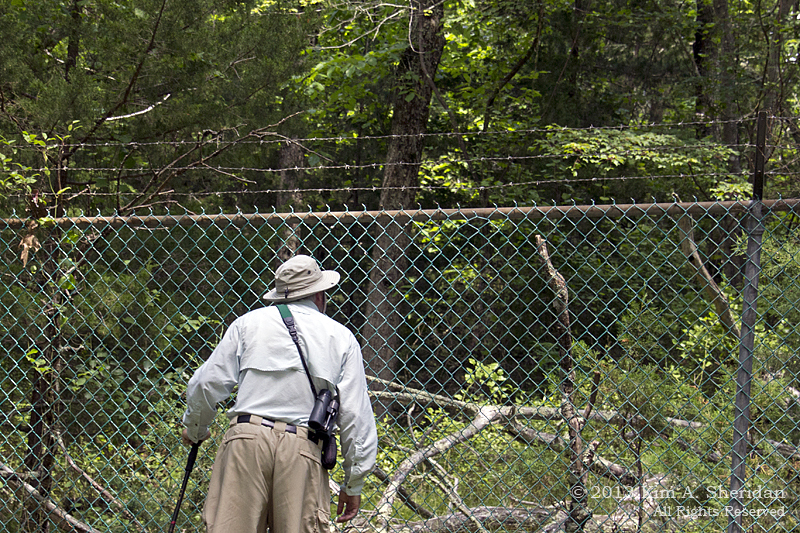 They were used to shelter the Fairmount Park Guards who once patrolled the park. Ahhh! At last! The Thomas Mill Road Covered Bridge. 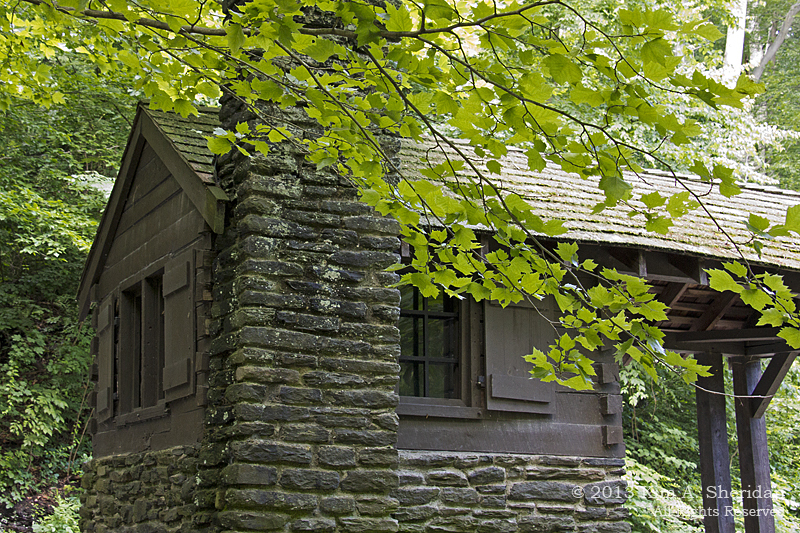 It was built in 1737, and restored by WPA in 1938. 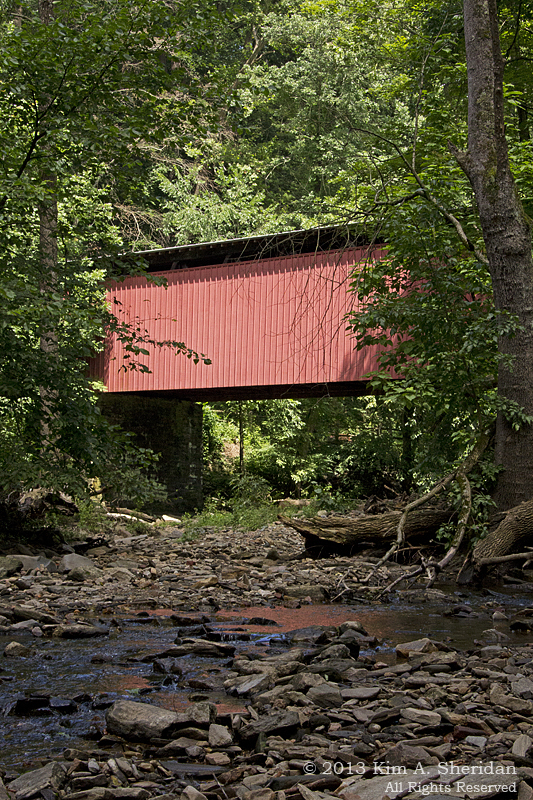 It’s the last covered bridge in the Valley, and the only covered bridge in a major U.S. city. 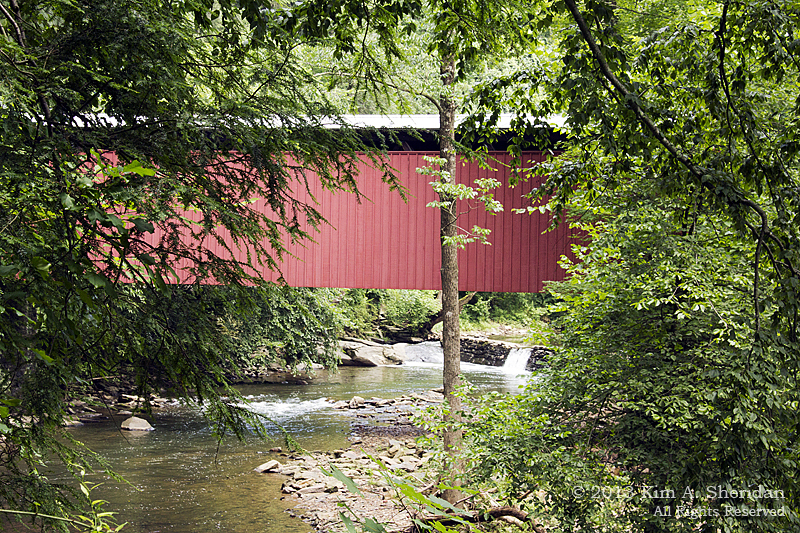 There’s something picturesque about a covered bridge. I think it’s the play of red against the green foliage. 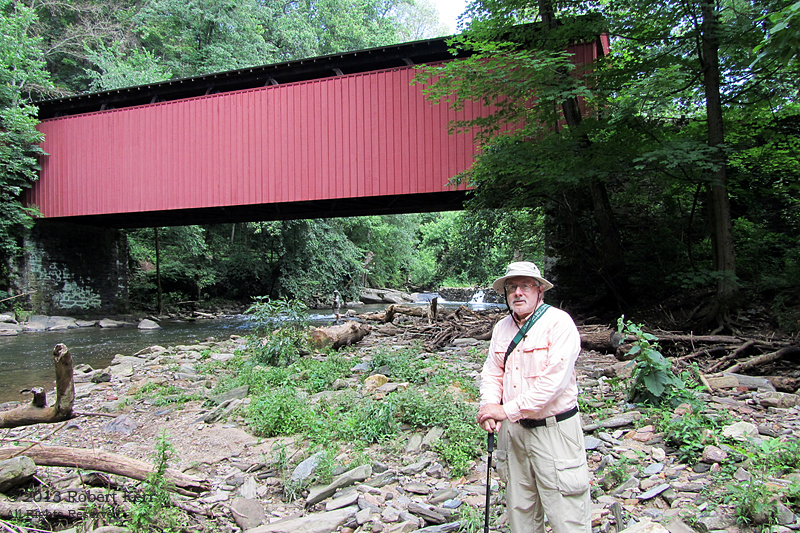 Aren’t all covered bridges red? Here’s Don, looking every bit the bold explorer, in front of the bridge. We crossed over the Creek here, and came back to Valley Green via the trail. A totally different walk. Where the Forbidden Drive was wide, the trail was narrow; where it was flat, the trail climbed sharply up and down; where the Drive was crowded with bikers and runners and horses, the trail was – well, not empty, but certainly less crowded. 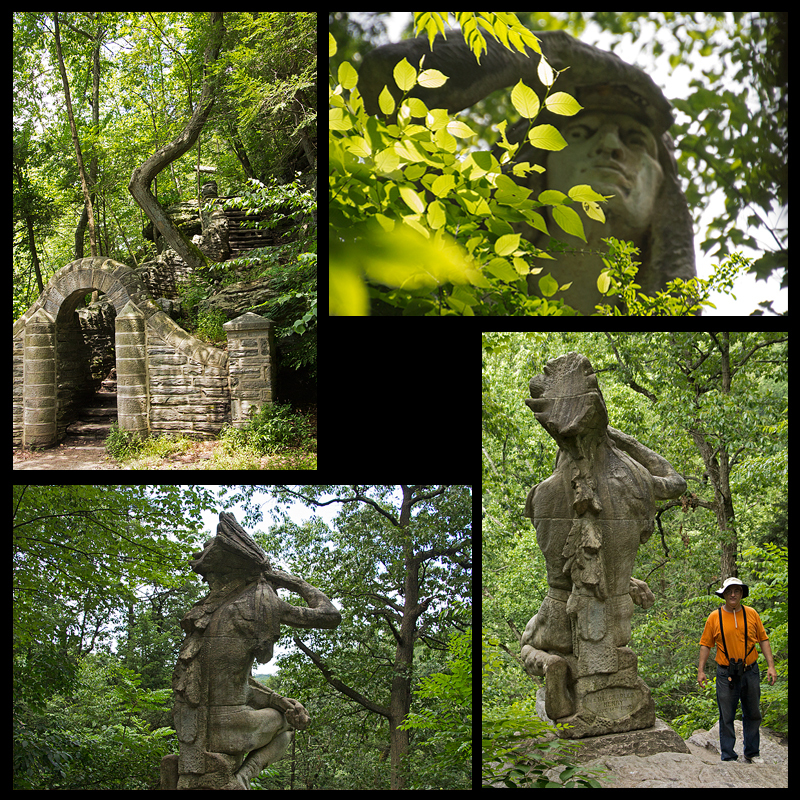 Our goal along the trail side of the Wissahickon was “The Indian”. The Valley was once the home of the Lenni-Lenape people. In 1902, after they were long gone, a 15 foot high sculpture was erected in their honor. It depicts a Lenni-Lenape warrior, kneeling and shading his brow as he watches his tribe depart from the region. Of course, the artist couldn’t be bothered to differentiate among the traditions of the various Native American nations that lived here. Which is why an Eastern Woodland Indian is wearing a Western Plains Indian headdress. On the Forbidden Drive side we’d come upon a sign marking the Indian statue, placed high up on the far bank of the creek. The only trouble was, we couldn’t see the statue for the trees. With the help of some other trekkers, we found the pathway to the Indian.This was a short but tough trail that went straight up; you get some idea of the steepness of the Gorge from this set of stairs. We found ourselves below the base of the statue. This was a great view, and I wanted a great shot, but as you can see but I blew the focus. Oh, well, I will just have to go back. Up at the top we got a perspective I am quite familiar with from my wildlife photography – the rear end. Here you can see that the statue is slightly more than two Robbs high. And since the Indian’s kneeling – well, that’s one big Indian. Leaving our friend, we discovered a much easier path back down to where the main trail awaited. Wish we’d known that before! From here back to the car, the trail got tougher, as we needed to clamber over roots, tree trunks, rocks and even small streams. A couple of times I found it easier to slide on my bum. Eventually we made it back to Valley Green, where another adventure awaited – finding a restaurant that was open on the Fourth of July. 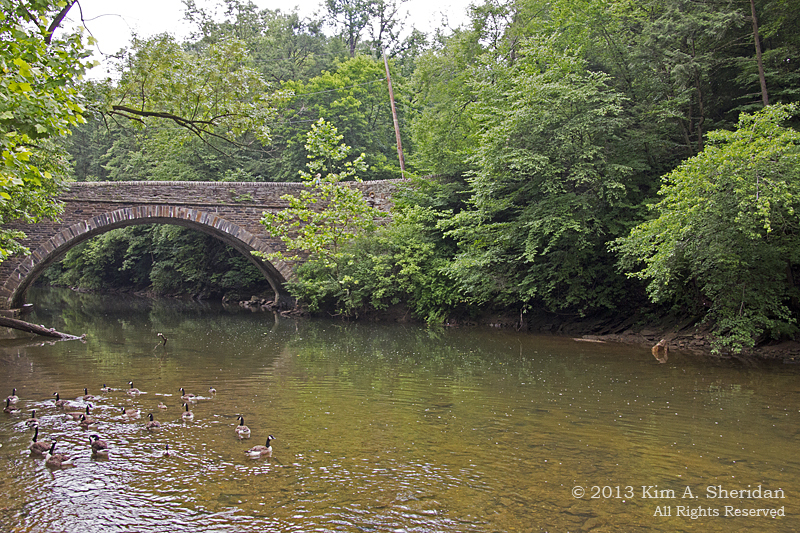 My dad grew up very close to the Wissahickon Valley in the 1930s and ’40s, and spent a lot of time there. And told me a lot of tall tales from his boyhood. This first visit just made me more determined to see more of the area he knew so well. Hey, hey, hey sports fans! This is Shelly Zuppa with your sports update here on KRTR 99.9 FM – Critter Radio. Today we have a real treat for all you sports fans – live coverage of yesterday’s hotly contested Herp Swamp Hockey match. Nothing like the timely coverage you’ll get here on Critter Radio! Let’s throw it over to our play-by-play announcer. 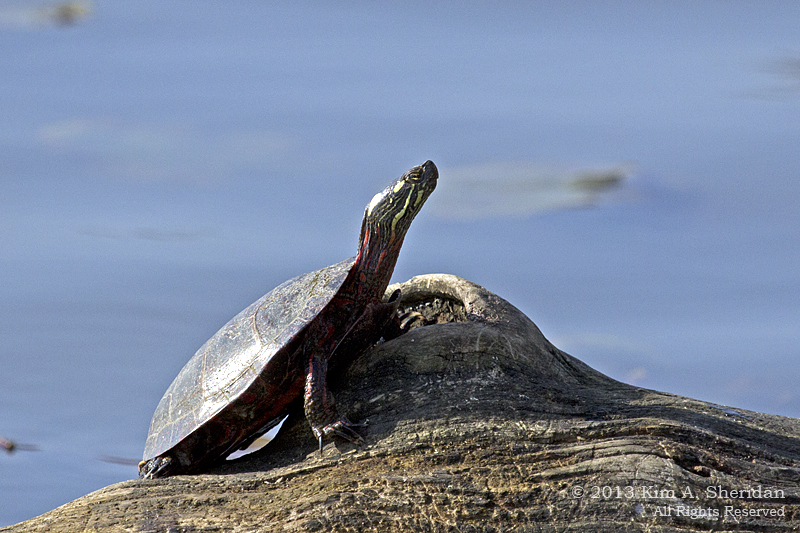 Hi, folks, I’m Myrtle Turtle the Dapper Snapper, and welcome to the Marsh Arena. For the Herp Swamp Hockey novices out there, let’s review the game. The league is restricted to herps – reptiles and amphibians, in other words. No fish, no fowl. No rules, no referees, no holds barred. Four teams for all the marbles, competing on land and in water. …as their favorite players from the Tinicum Turtles take the field. 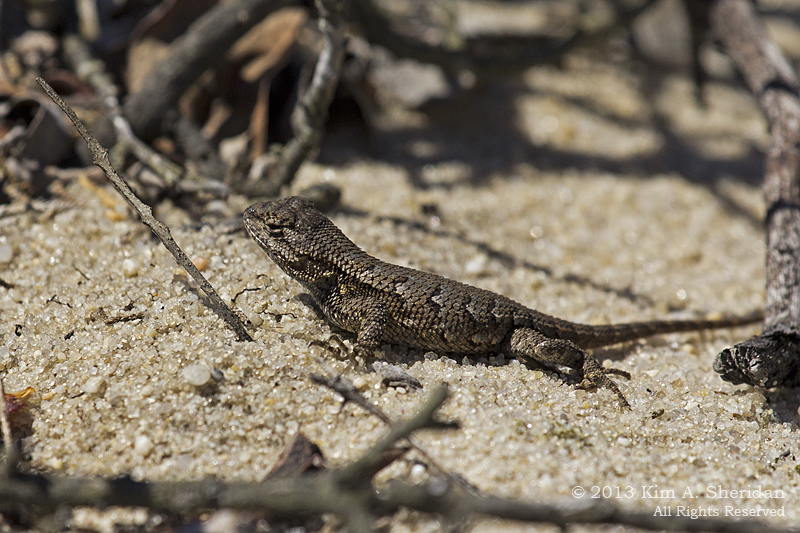 Right off the bat, the Higbee Beach Fence Lizards take the offensive by going on defense. These guys would lead the league if the game were Freeze Tag. At the first whiff of an opponent, they become motionless. 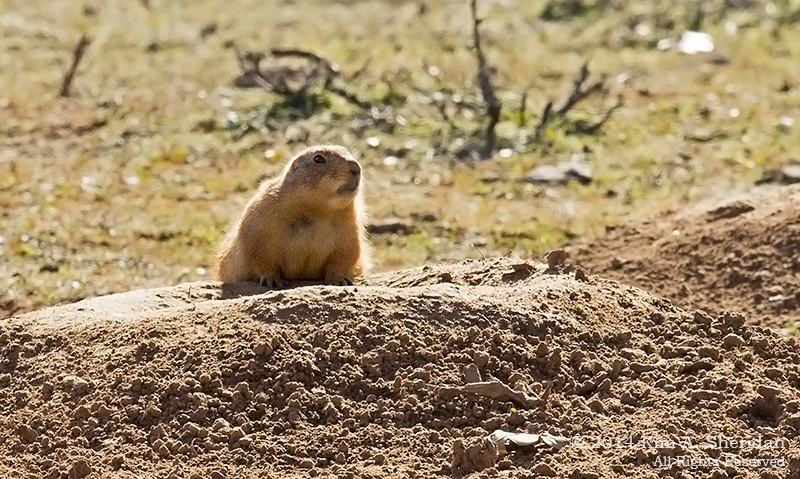 “If I don’t move – you can’t see me!” is their battle cry. 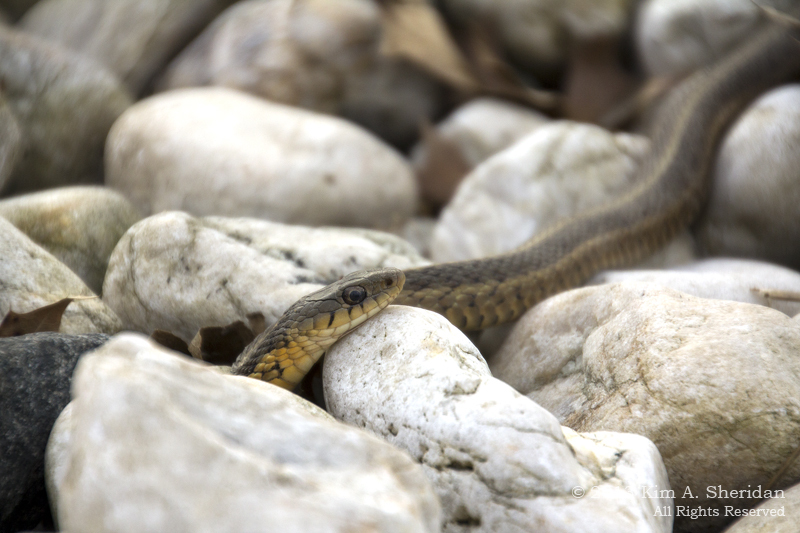 The strategy must have worked, because we can see they’ve got this Garter Snake player from Serpents United on the rocks. 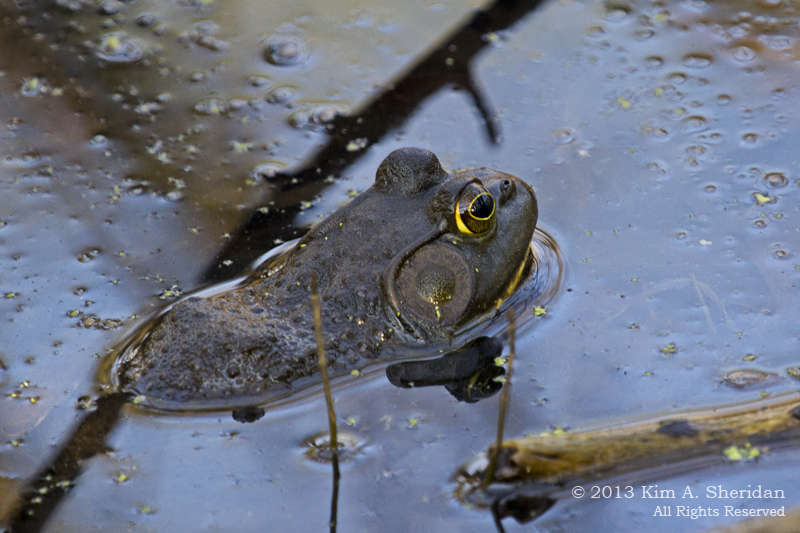 Meanwhile, this American Bullfrog is mired deep in his own zone. Maybe water polo is more his game. 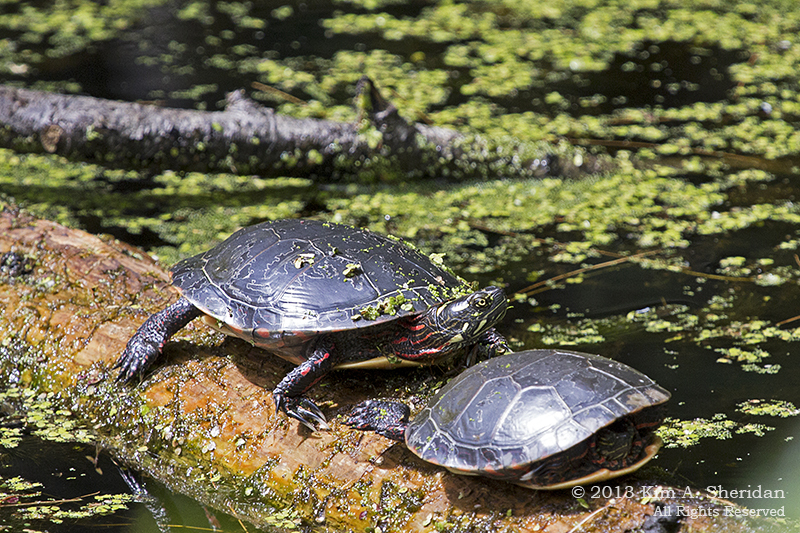 Back to the action, these Painted Turtles from Heinz seem to have been benched. 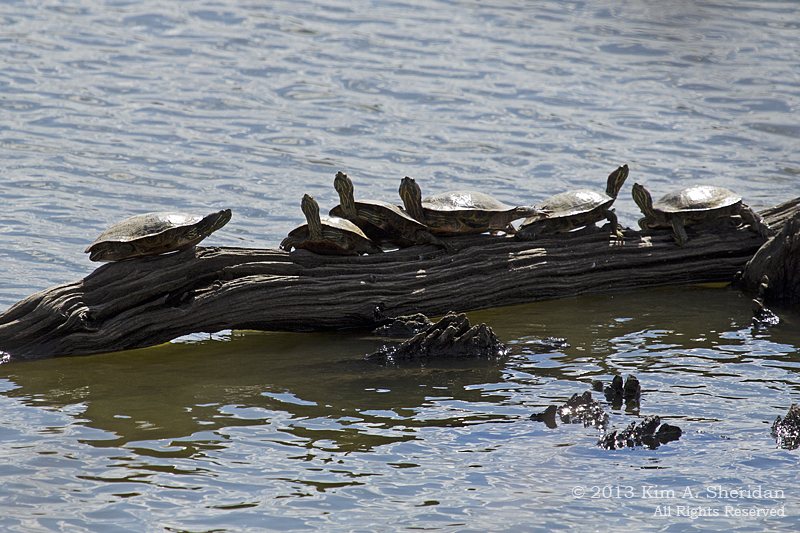 The Tinicum Turtles try to overwhelm other teams with sheer numbers, but spend most of the game sunning themselves on the sidelines. It’s enough to make a fellow turtle weep. Wait, folks, what’s this… There’s a Spider Crab on the field and creeping away with the ball… Oh my gosh, we have a streaker! Don’t look, Ethel! 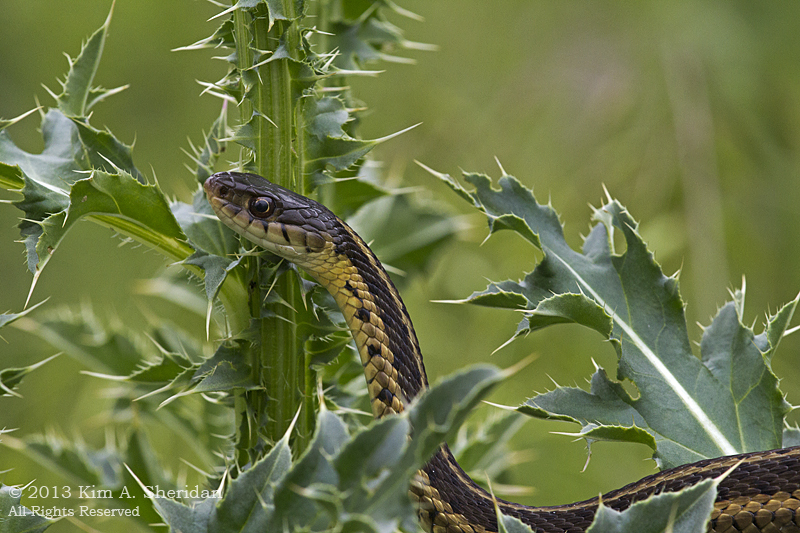 The Cape May fan contingent is not happy with this turn of events, as a Ribbon Snake shows his displeasure. And the Serpents take the match! Well, folks, it’s all over but the shouting. 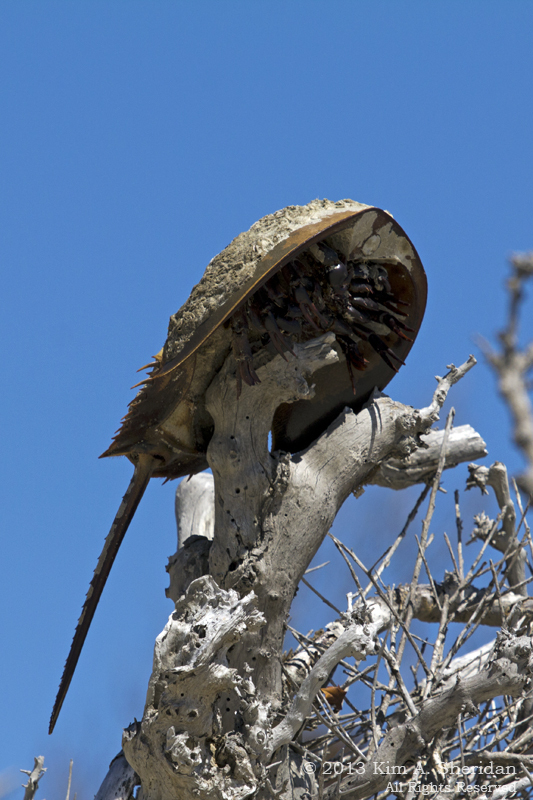 This Horseshoe Crab spectator seems overwhelmed with emotion. What an exciting game! The rematch is bound to be a barn-burner. Be sure to tune in again to catch all the action right here on KRTR Critter Radio. 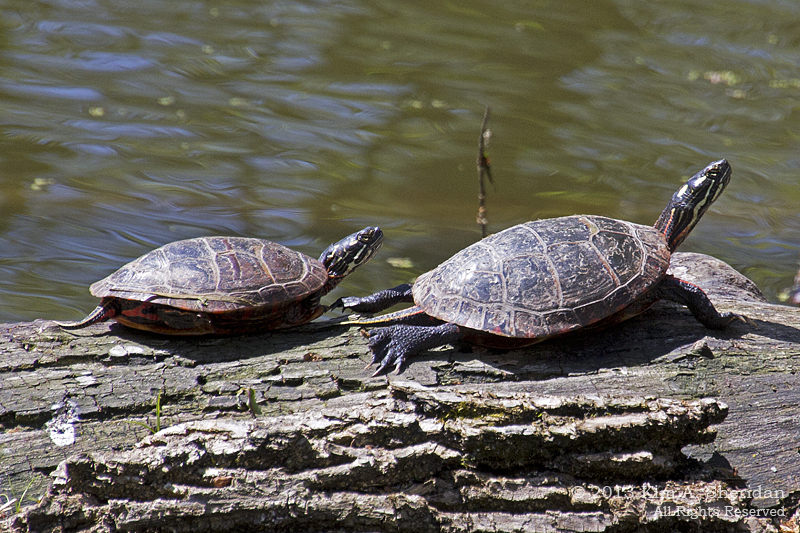 I’m Myrtle Turtle the Dapper Snapper from the Marsh Arena – good night! 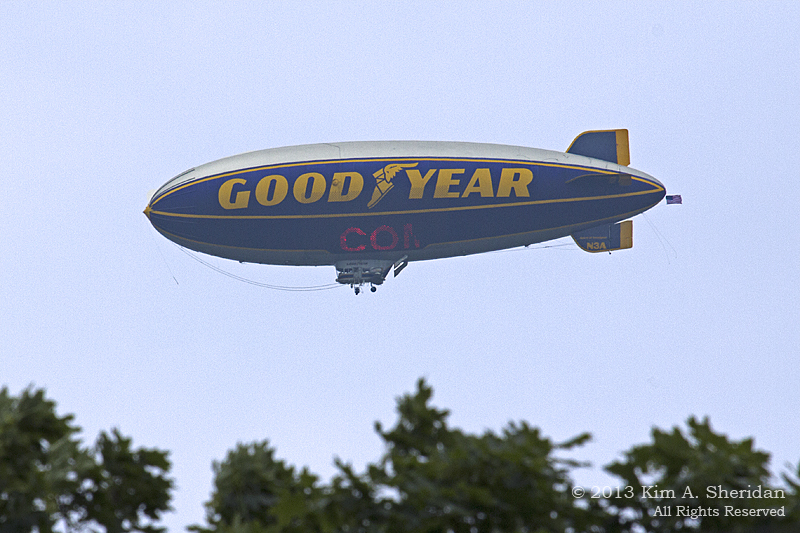 Aerial coverage provided by the Goodyear Blimp. 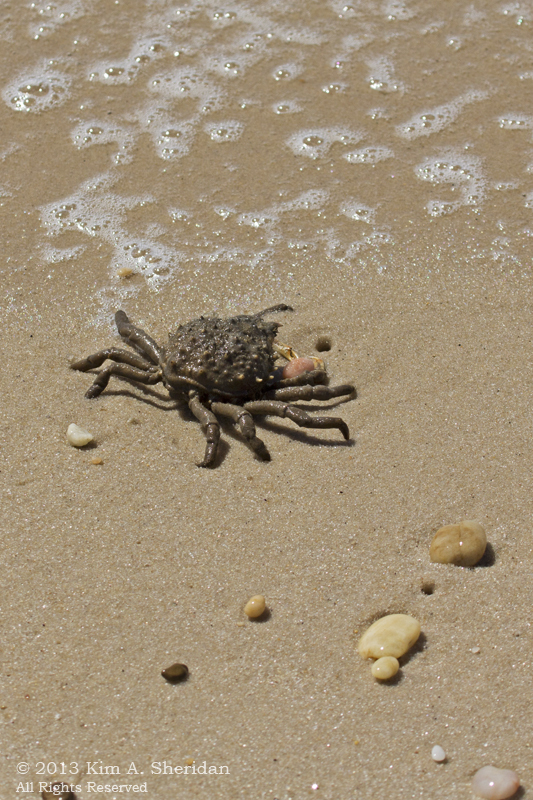 FUN FACT: Most crabs that walk on land do so sideways, but the Spider Crab usually goes forward. It’s particularly fond of draping itself with all sorts of adornments, including living sea plants, bits of shell and other oddities. Presumably this is for concealment, but maybe the crab’s just really fashion forward! So what is the Pine Barrens anyway, and why is it barren? 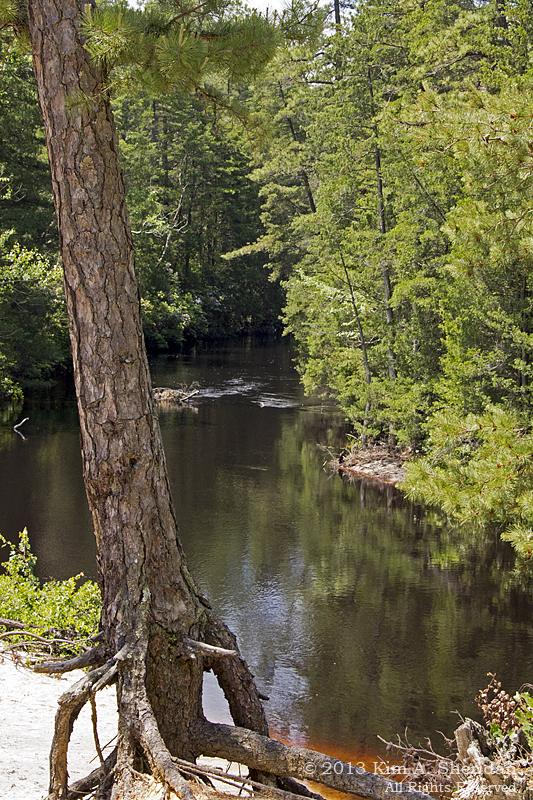 The Pine Barrens is a vast area in the southern New Jersey coastal plain, sandy and heavily forested. It was called “barren” by early European settlers, who found that the crops they planted wouldn’t grow there because of the acidic, sandy soil. The area is by no means an ecological desert. 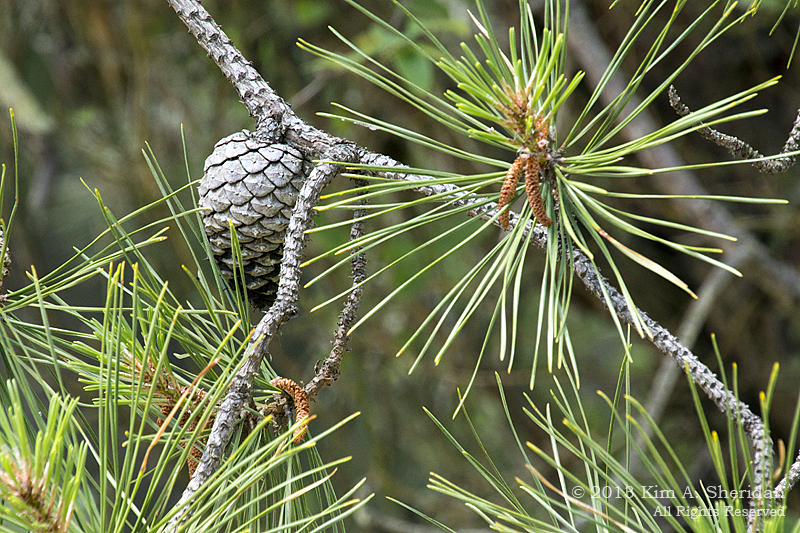 Oak and Pitch pine thrives there, including the rare pygmy Pitch Pine, and there are orchids, carnivorous plants and numerous other plant species. Amongst the forest are boggy wetlands, and tea-colored rivers. 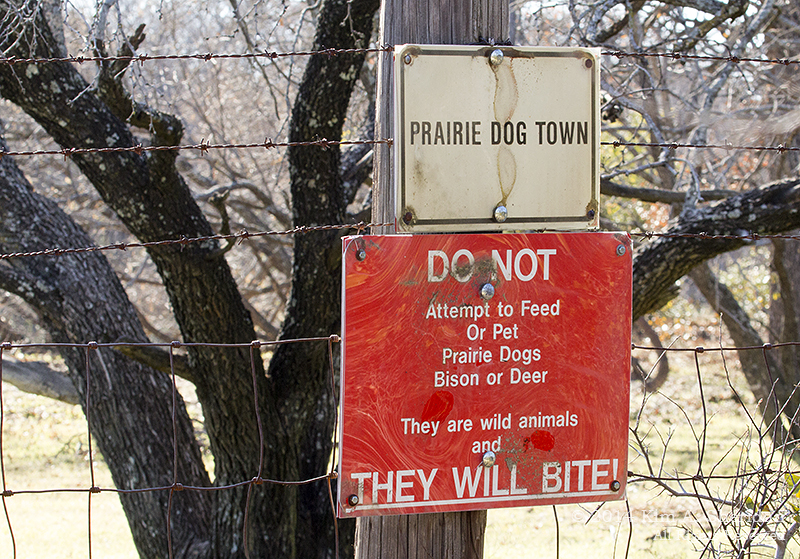 Here too are blueberry and cranberry growers, ghost towns, and preserved historic villages. Like Batsto, which I visited with friends not long ago. Our intention had been to take a guided nature walk led by a friend of Don’s, but we arrived to find it had been cancelled. So we went exploring on our own. 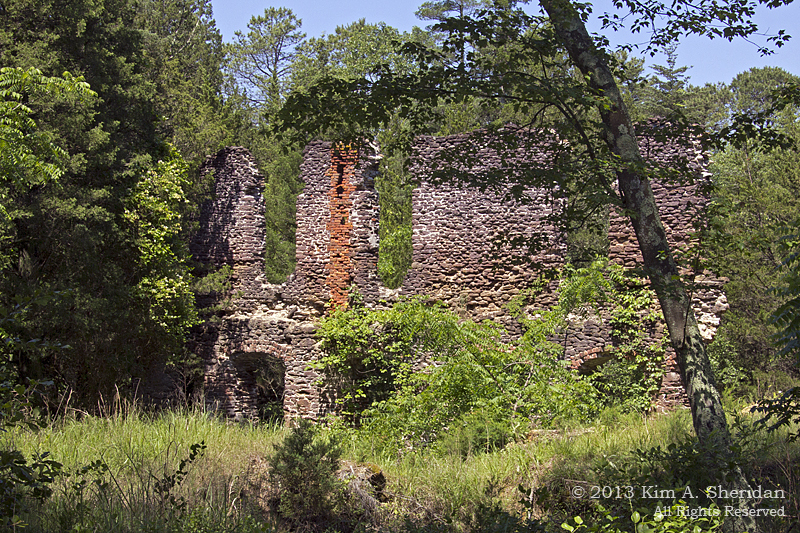 These are the ruins of the paper mill at Harrisville, one of many ghost towns dotting the Pine Barrens. Most of it is enclosed with chain link fence. While Ned and I were figuring out how to shoot over the fence, Don and Robb found another vantage point. 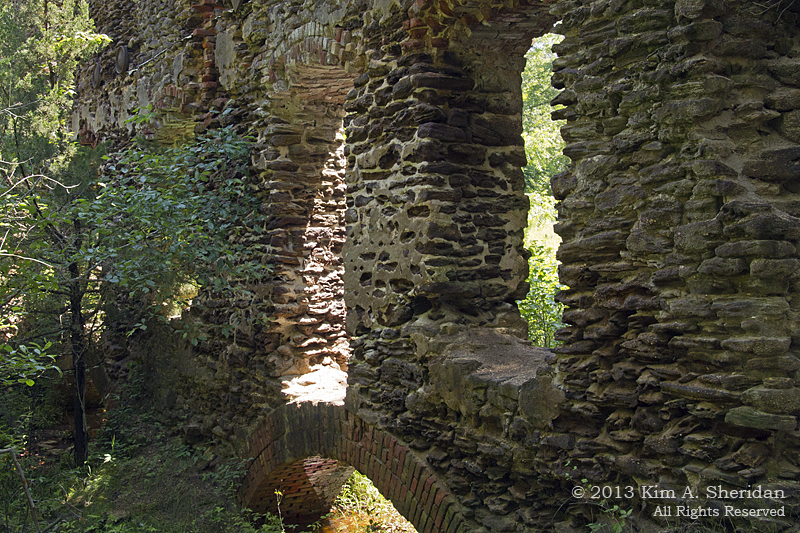 (Wink, wink) There was just one wall left standing – but it was a really cool wall! We then decided to take the trail to Martha’s Furnace ourselves. Why, is anyone’s guess, as you’ll see in a minute. 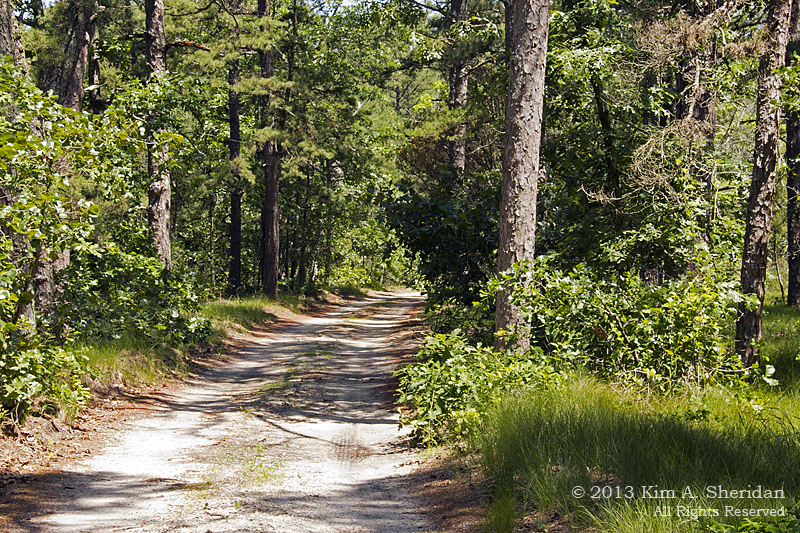 The trail was my first taste of hiking in the Pine Barrens. The sand road wound through a forest of predominantly pitch pine. The soft white sand is known as “sugar sand” for its consistency. 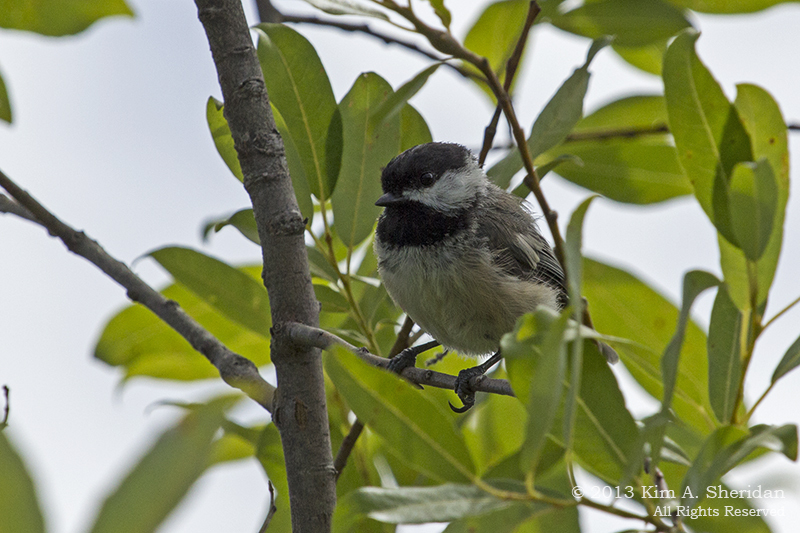 I could hear lots of birds, but didn’t have much luck seeing them in the dense trees. And no bears! 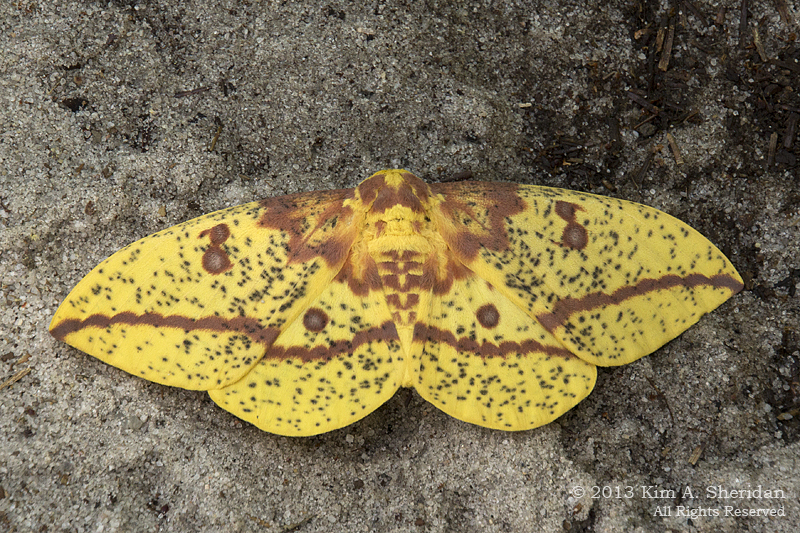 We did find an Imperial Moth (above) that was so still, the boys mistook it for a leaf. Then they thought it was dead. (It wasn’t.) 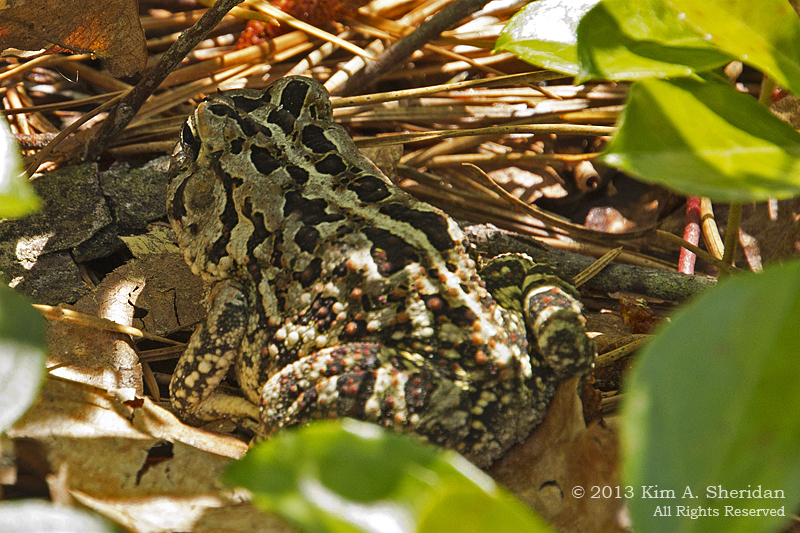 We also spent some time with a Fowler’s Toad, (below) wearing Toad Army camouflage. I was the one to find both of these creatures; maybe my wildlife spotting skills are improving. At a couple of points the road ran down to the Oswego River. Definitely my favorite part of the trip. 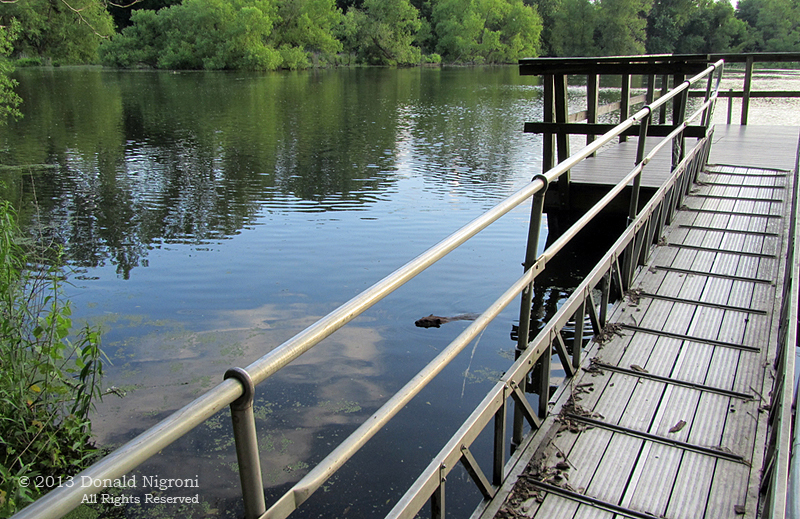 The dark brown water gets its color from tannins from the cedar tress combining with iron in the ground. Looks like you are canoeing in a tea cup! Martha is another ghost town, this time centering on a bog-iron furnace. Years ago the state surveyed the ruins, and then buried it and fenced it in. So, of course, when we got there, there was nothing to see but a mound of dirt covered with weedy shrubs and trees inside a fence. Actually, if the scheduled walk had happened, we’d have had a knowledgeable naturalist to show us numerous interesting plants and critters. It was never really about Martha itself. Here’s Don trying to figure out why we came. Well, the walk was nice. 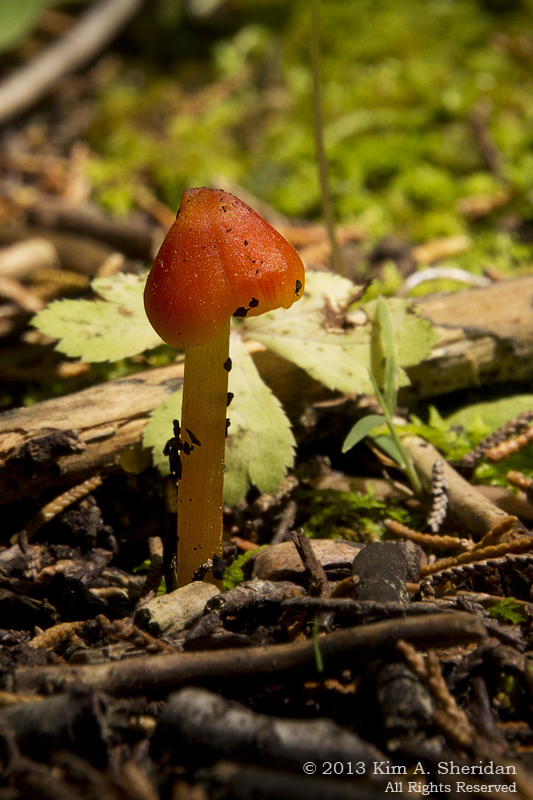 Even on our own, my first taste of the Pine Barrens whetted my appetite for more. 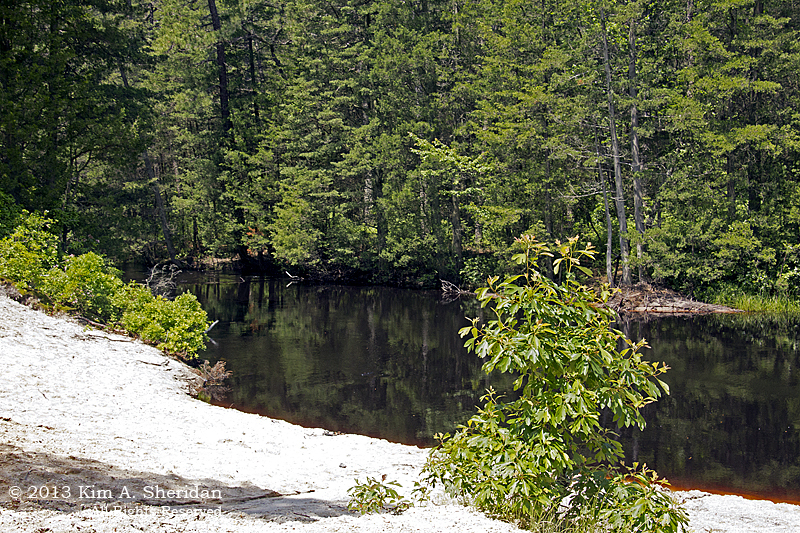 Conservation Piece: In 1978, the Pine Barrens became the country’s first National Reserve, when 1,100,000 acres was designated the New Jersey Pinelands National Preserve. The area comprises most of seven counties, three state forests, and two National Wild and Scenic Rivers. The Reserve was created to protect not only the natural beauty of the area, but its history, folklore, and unique culture. The place continues to be largely rural, and may be the closest New Jersey gets to “wilderness”. In which… three intrepid explorers go search of a wild critter and get far more than they bargained for. The Setting: Hoy’s Pond, a deepwater pond with a fishing dock across the road from the impoundment at Heinz Refuge. 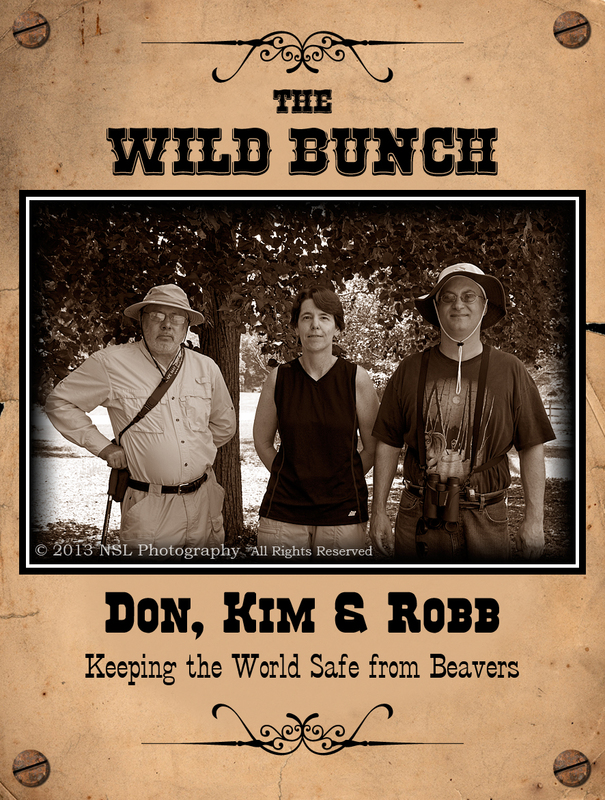 The Players: Don, Robb and I; Mr. Beaver. Prelude: Fall 2012. 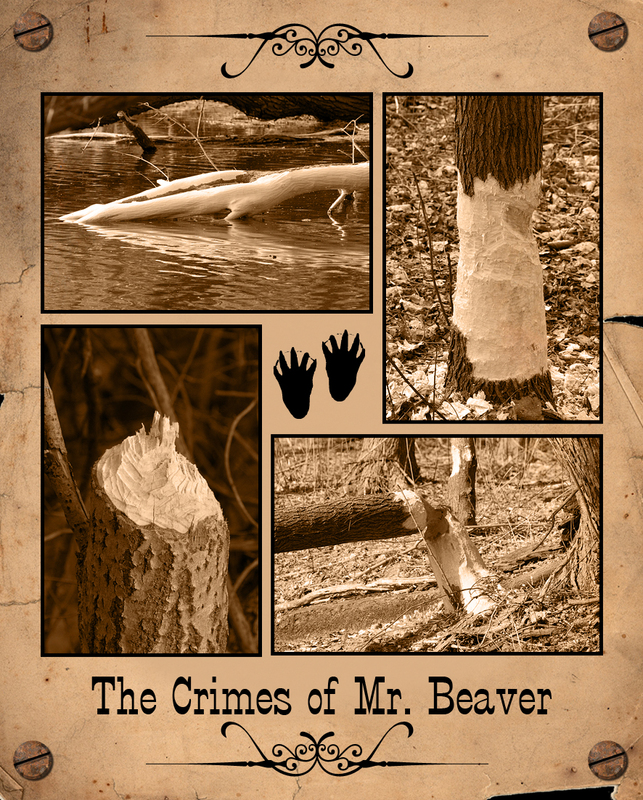 Gnawed trees begin appearing at the Refuge, sure signs of North American Beaver activity. First Things First: March 27, 5:30 PM. 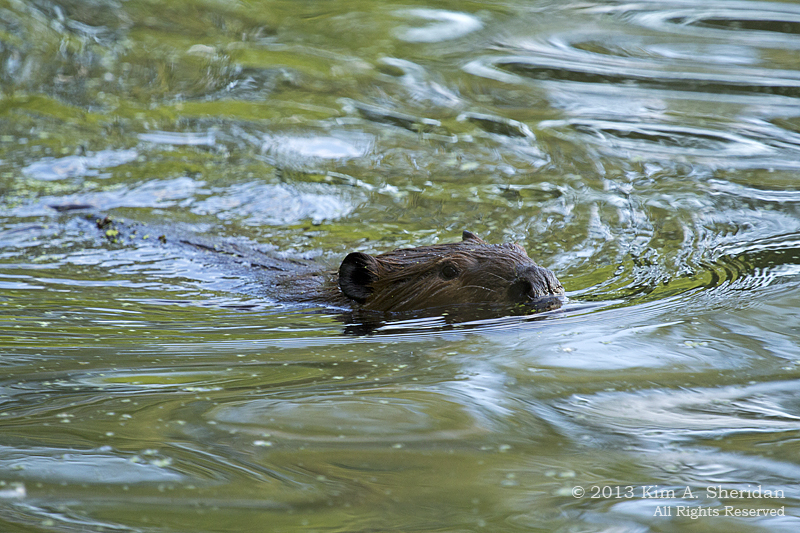 I spy Mr. Beaver on the far side of Hoy’s Pond. Of course, that would happen to be the one time I didn’t have my camera with me. No one believed me. The Second Time Around: June 6, 8:15 PM. Robb has a close encounter with Mr. Beaver at the dock, and comes away with a short cell phone video. Plans are laid for the Great North American Beaver Expedition. Third Time’s the Charm: June 11. Robb, Don and I set out for Hoy’s Pond. Along the way, Don regaled us with stories of a fatal beaver attack in Belarus. 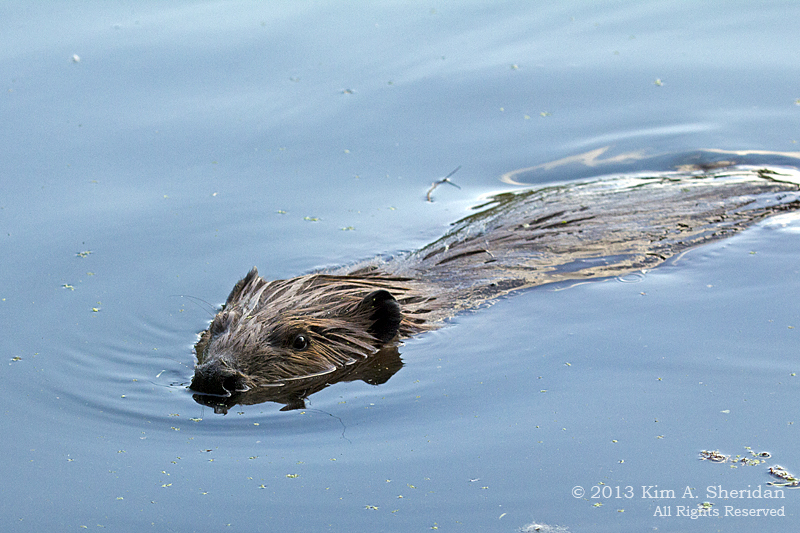 He and Robb debated how to protect themselves from marauding beavers – mostly by hiding behind me. When he was some 20 feet away, Don and Robb, being the courageous and chivalrous gentlemen that they are, beat a hasty retreat, leaving me to fend for myself. I was focused solely on GETTING THE SHOT. When the boys’ cries of alarm (“It’s gonna CHARGE!”) became too much to bear, I took a step back. 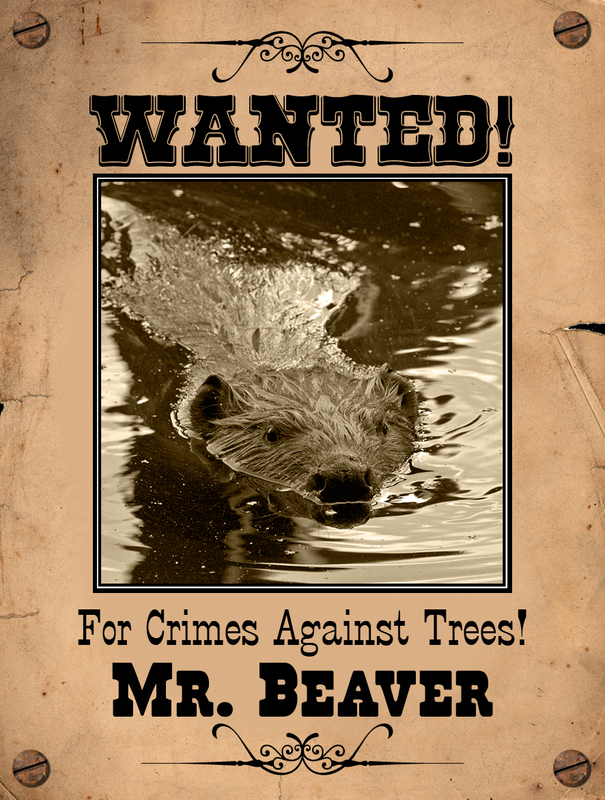 Whereupon Mr. Beaver gave a tremendous SLAP of his tail and disappeared, never to be seen again. We were all startled at the size of the tail slap. The resulting splash looked like he’d leaped from the water and did a tremendous belly flop. 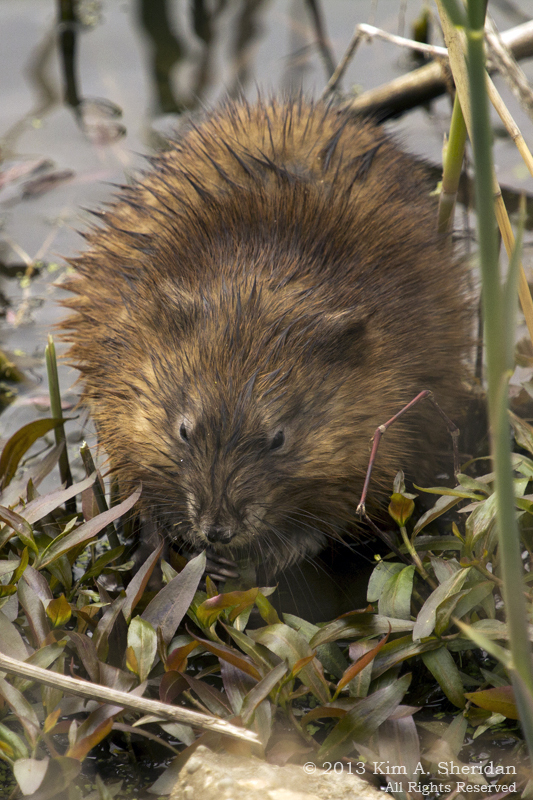 FUN FACTS: Adult Beavers weigh from 35 to 60 pounds, and have poor eyesight. Their good hearing and strong sense of smell more than make up for this. They can swim well and stay under water for up to 15 minutes. 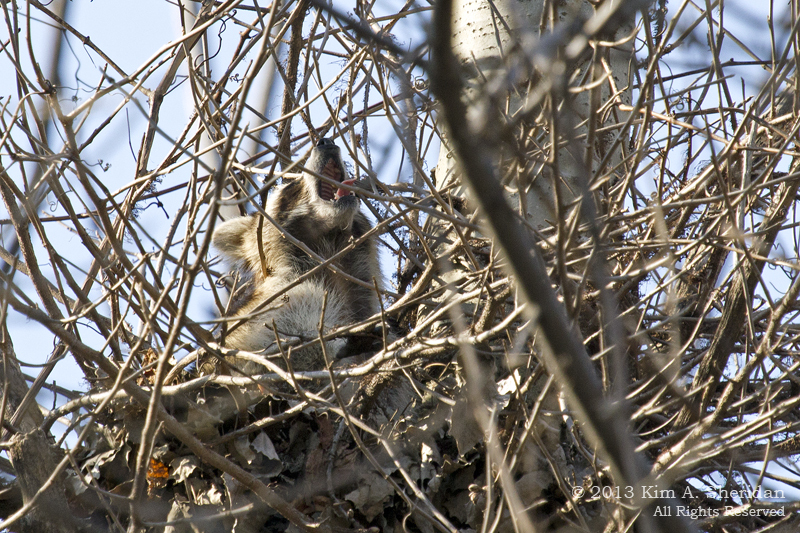 Their sharp teeth continue to grow throughout their lives, so it’s a good thing they have trees to gnaw on! 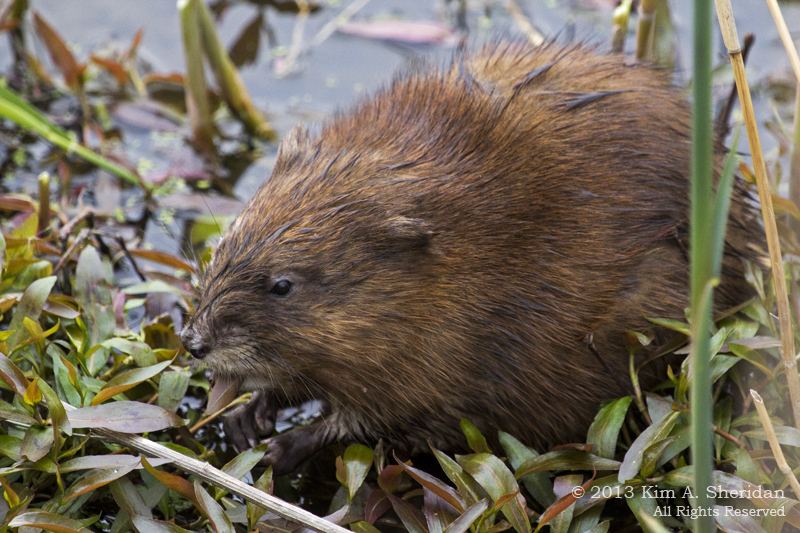 Beavers eat trees and tree bark, as well as other plants. The dams they build are for protections and shelter; the largest one ever built was over 2500 feet long! Always remember wild animals are unpredictable and should be viewed with caution and respect. Beavers are generally peaceful critters who dislike biting, but those teeth are SHARP and capable of delivering a fatal wound. Furthermore, too much attention can stress an animal. Moral of the story: always use extreme caution when dealing with any wild creature, and respect its right to go about its life without human interference. Remember, you’re the visitor on THEIR turf; be a good house-guest! 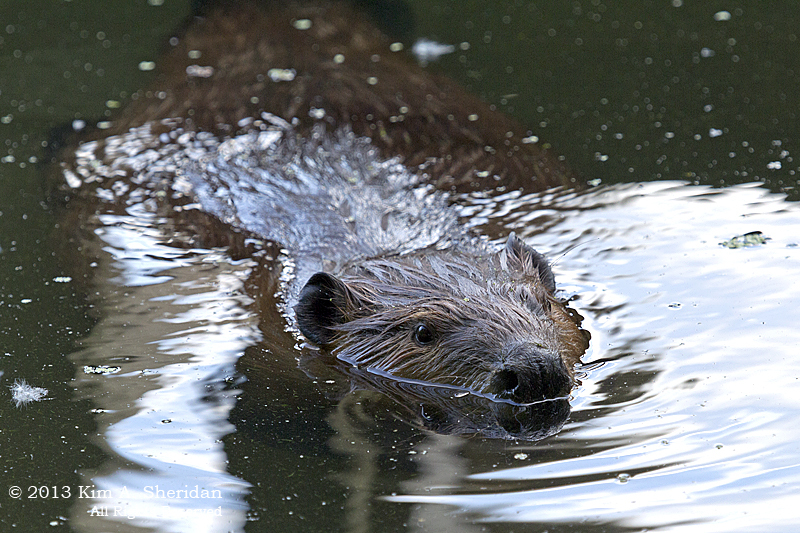 “Hoy’s Pond with Beaver” photo courtesy of Don Nigroni. “The Wild Bunch” photo courtesy of Ned S. Levi, professional photographer. Taken with my amateur equipment, and Canon to boot. Good morning, all you bonny lads and lassies out there in Animal Kingdom! This is the “Wee Furry Beasties” Countdown Show on 99.9 KRTR – Critter Radio! I’m your host Fergus Alastair MacRatt, comin’ at you with all the warm and fuzzy hits you need to get you through your day. Let’s get right to the countdown, shall we? Kicking it off at Number Six, we have the King of Nibbles himself, Brer Rabbit, with his hare-raisin’ version of “Little Bunny Foo Foo”. 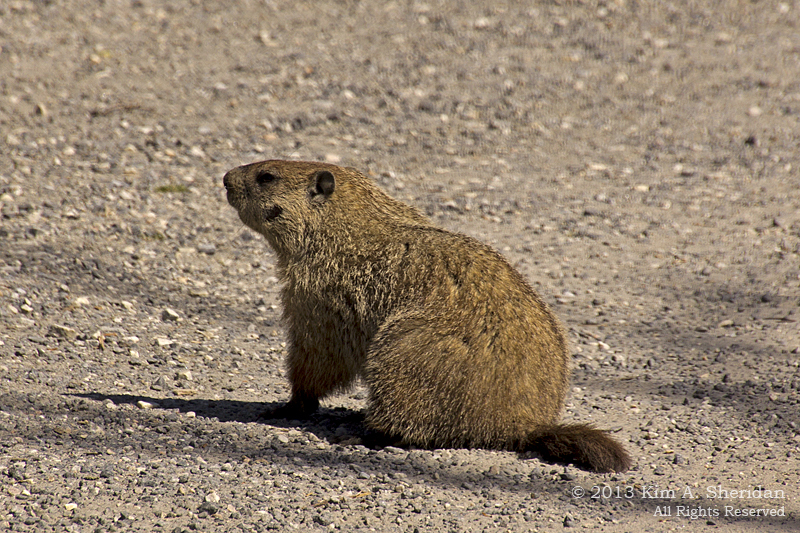 Here’s a fair Groundhog lassie and her wee bairn that just can’t resist the call of the open highway. 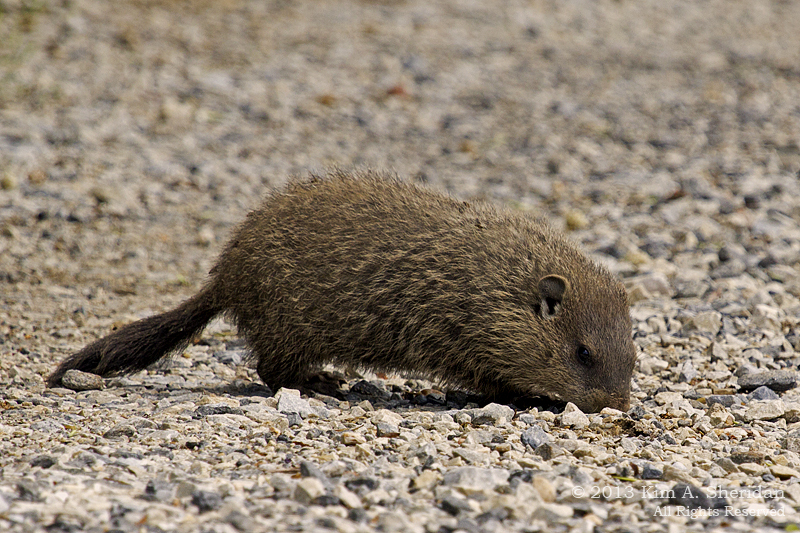 At Number Five, it’s Big Mama Woodchuck and Whistlepig Junior, singing “On the Road Again”. Next we have Slinky Mink checkin’ in from Michigan’s Big Sable River. Look at that pink nose – this lad needs some sunscreen! Doesn’t stop him from rockin’ out with our Number Four hit, “Pop! Goes The Weasel”. My, it’s early in the day for this yawnin’ Raccoon! Our next performer, Little Rascal, had a bit of a nap, but he’s awake now, and swingin’ in the Number Three spot with “Don’t Sit Under The Apple Tree”. 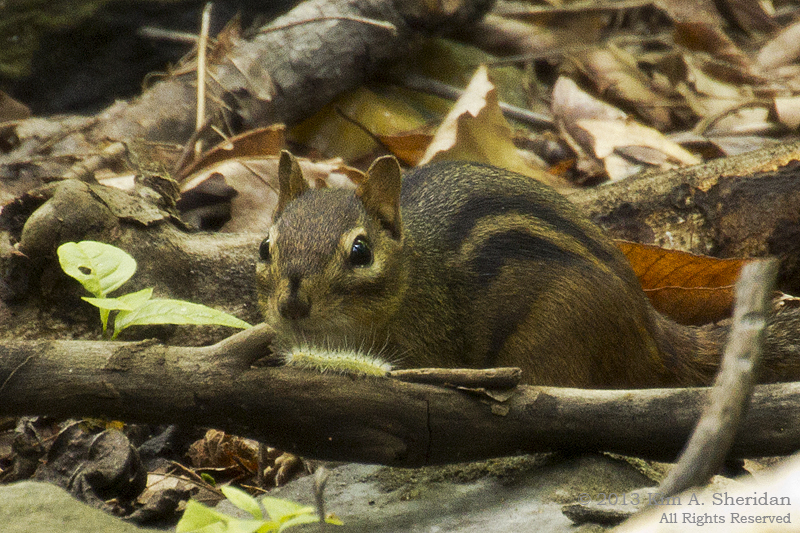 Now, we all know how chipmunks love to stuff their little furry faces with good eats. Everybody’s favorite Chipmunk, Alvin, reckons he likes dancin’ with the lassies even more. In at Number Two, here he is now with “Cheek To Cheek”. Ah, savin’ the best for last! 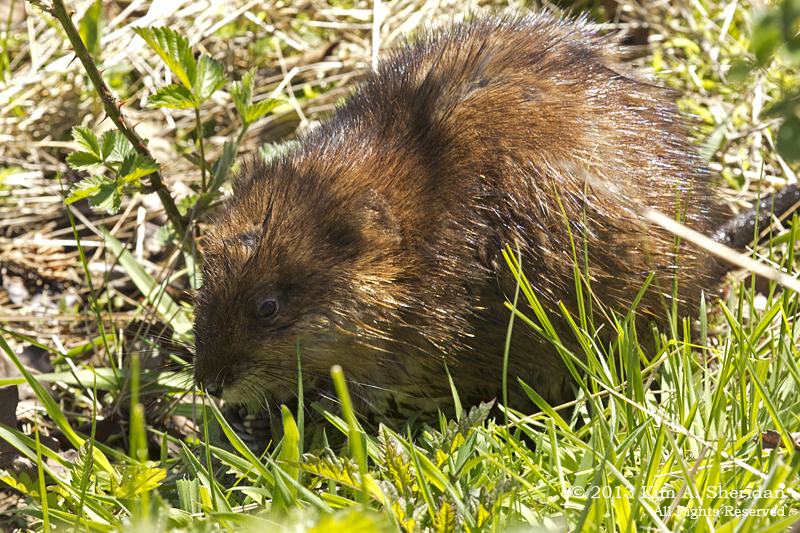 You know, we Muskrats get a bad rap sometimes, but really we’re just rockin’ along, tryin’ to get along. Nobody says it better than Susie & Sam with our Number One hit, “Muskrat Love”. Well, that’s it folks, this week’s “Wee Furry Beasties” Countdown. Next up on “Forest Follies”, we have a mind-boggling tale of three foolish humans (and really, is there any other kind?) Aye, seems they set out one evening to track down a ferocious varmint, and got a wee bit more than they bargained for. Until then, I’m Fergus Alastair MacRatt, keepin’ it wild on 99.9 KRTR – Critter Radio!